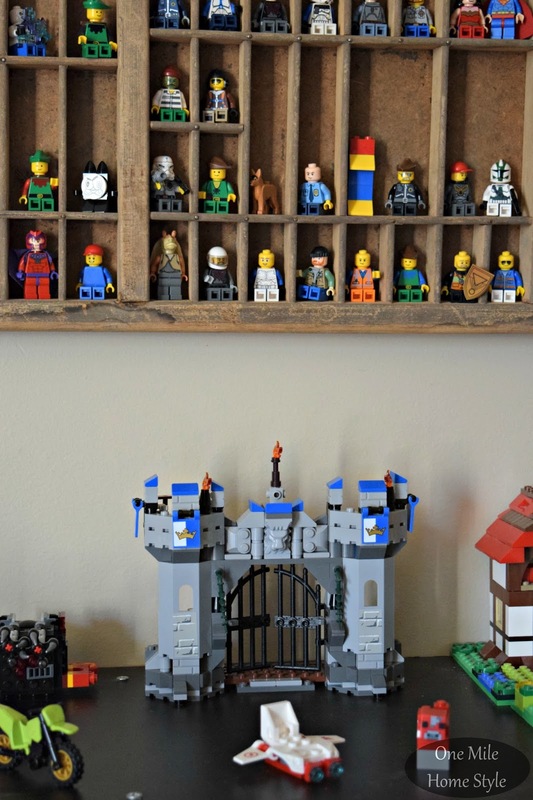 If you have kids in your home, chances are, you probably have Legos in your home too. If I can give you one piece of advice, it would be to think about how you are going to organize and store them, before you buy that first box. 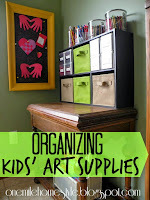 Also, no matter how organized you are, be prepared to "assist" in the organizing and re-organizing of said Legos too. 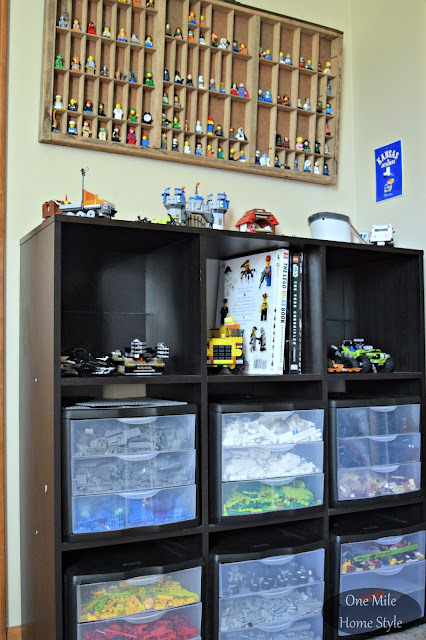 In my attempt to make my boys a little more responsible with their Legos, and give them a say in the organizing system they were going to use, I asked their opinions on how they would like to organize them. We decided to sort by color, because that's what made the most since for how they play; there are others who organize by brick size/type, or even others who keep each kit separately organized. Conveniently the plastic 3-drawer organizers we used fit perfectly into the cubicle shelving unit we already owned. As you can see, each color gets its own drawer, although some colors get two drawers since we have so many, but we did still manage to have a couple of open drawers available too. We also have all the mini-figure pieces/parts/accessories in one drawer as well. One of my all-time favorite auction finds was this vintage printers tray. All the little cubbies make it a perfect display space for mini-figures, and it also keeps them easily within reach. Don't be afraid to think outside the box a little bit for your storage and display needs, sometimes the most unlikely items can be just what you need for your space. We had to make sure that there was plenty of display space available too. 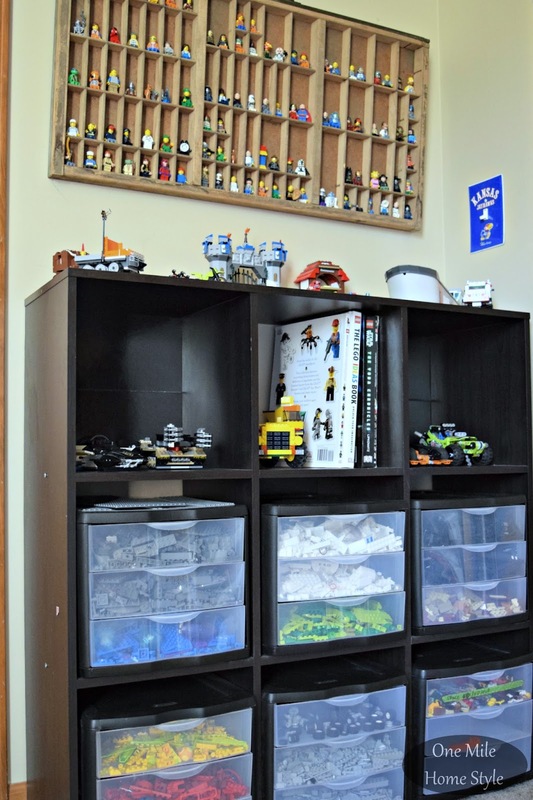 The boys know that they can only display as many finished projects as they have room for (although they have a hard time following this rule). This keeps all of the half-finished projects a little more under control. With all of these Legos also comes all of their building manuals. 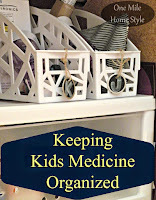 We have found that it's just easier to keep them in a couple of scrapbook paper boxes*, they are easy to access and mostly neatly contained. This organizing and display system has worked out well the in the boys shared playroom/study, and they do pretty okay at keeping neat, but occasionally my OCD kicks in and I have to get the color organizing back under control! I just can't take it when the colors are all mixed together, tell me I'm not the only one! This is adorable. 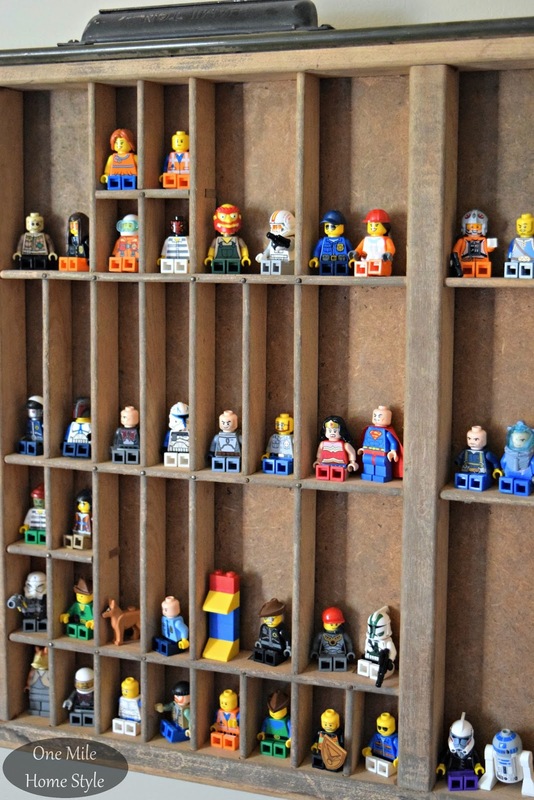 I especially love the separation of colors and storage for the Lego characters. I built my son a Lego table a while back, but his Lego's still find themselves all over our home. 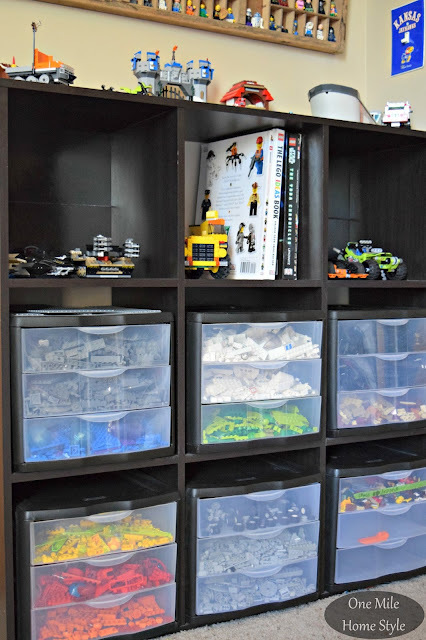 My daughter doesn't have as many Lego's as he does, so I think this would be a quick and easy way to store her Lego's. Thanks for the inspiration! Thanks for visiting Crystal! Good luck with your organizing! I hear ya about the color coordinating. I used to have high standards back in the day. But after 4 kids I have had to lower them considerably, otherwise I would have gone mad. 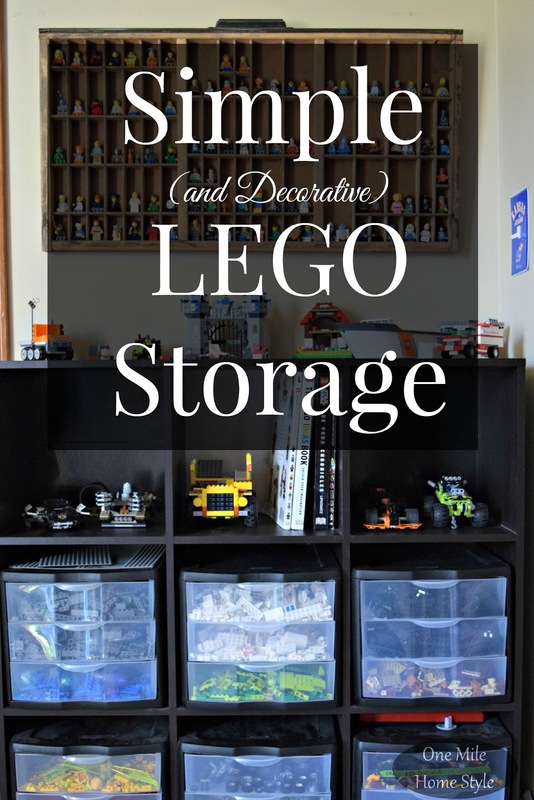 The storage unit is fantastic though, just what is needed for the legos. I thought I'd seen it all when it comes to LEGO organization but that mini fig storage shelf is really one of a kind and quite simple to have installed! Thanks for the idea! I'm going to start keeping my eyes out for something similar! Are the links for the actual products you have? The dimensions don't seem to work. Hi Rebecca! Yes, those are the exact ones we have. I will say that the storage drawers do overhang the front of the shelves by about 1/2 inch or so, but otherwise they do fit right in the cubes. Thank you for this suggestion. I have a similar shelving unit and have been thinking it would be a good place to stash the Legos, but I couldn't find clear boxes that would fit in the spaces. These drawers are just what I need! I want to order but the dimesions don’t seem to match up with the drawers/storage unit. �� are the links accurate still? Hi Megan! The links are still accurate for the drawers and storage unit. I'm not sure why the product page shows a size reference for the wrong drawers. These are roughly 11x13x9 so they fit really nicely inside the cube organizer.